White sneakers have become so popular and fashionable that almost all women wear them in everyday life. They don’t ask seasonal changes are always practical. The only worry that you may have about white sneakers is their demand of always looking clean and fresh. While there are several cool ideas on how to take care for white sneakers, we are here to discuss something else and perhaps more important regarding to this fashion trend. Let’s see how to wear white sneakers and what to match with them to look more stylish. Whether you rock a black, beige or white trench coat it will always look beautiful with white sneakers. Consider this style when you want to combine the elegance with the sporty. Such contrasts grab attention and keep you fancy. Retro inspired sneakers are much more suitable for this look but you are free to choose any style of white sneakers you like. Make sure you use matching shades and accessories that keep it simple and showcase your carefree style. The best way to draw attention to your white sneakers is wearing them with cut-off frayed denim. This combination works the best. It seems as if cut-off frayed jeans are made special for white sneakers. You showcase not only some body but also the beauty of your fashionable shoes. The created style is also very cozy for spring and summer. Just wear invisible socks with this and you are done with a cool street style. If you like wearing skirts as style statement then we offer you to add more interest to your look with white sneakers. The super elegant mid-length skirts are the most fashionable skirts for the moment. They look perfect both with high heels and sneakers. If you are more into sporty looks then opt for a cropped top, mid-length pencil skirt and finish your stunning look with white sneakers. Well, you may go for messy waves to make your hair suitable for the look and rock trendy sunglasses as a finishing touch. This is a well-balanced and stylish look for everyday go. 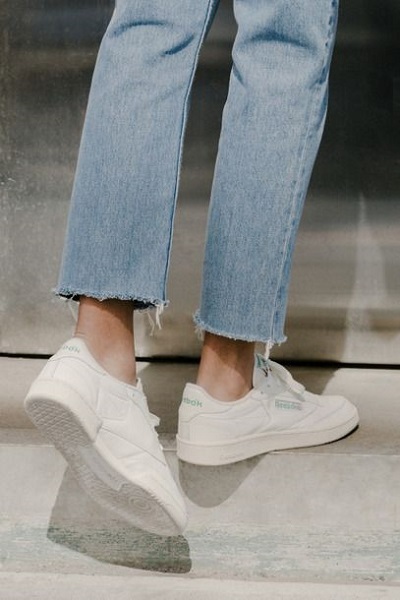 Taking into account the fact that white sneakers are the most classic of all other styles we can say that they create a good matching with classic pantsuits. Instead of high heels you wear comfy sneakers and keep your classic and elegant look. Pay attention to your hairstyle, makeup and accessories and you’ll reach the desired cool look for your office style. Who says white sneakers are meant only for tight skirts or sporty jeans? Look at this gorgeous style. You can match your light summer dresses with white sneakers and feel so comfy during the whole day. Women know how to use their fantasy and creativity in order to create unique looks. So, do the same with your white sneakers and summer dresses. The length of the dress doesn’t matter, just do it!